Balanga, Bataan. In the Philippines, the multi-faceted issue of Filipino migration touches almost every aspect of the lives of most Filipinos. There are issues linked to their labor, political and cultural rights; their health or their reintegration when they decide to return home; their remittances and more. Unfortunately, the issue of remittances of the migrants is what mostly ordinary Filipinos could refer to when asked about Filipino migration. Society in general equates migration to remittance. The public does not think more profoundly and reflect on other issues besides remittance such as the psycho-social costs that come with migration. This is what the Church would always talk about to remind everyone of the other issues linked to migration. On the National Migrants Sunday (NMS), last February 17, 2013, the Church once again had her chance to speak on such issue. 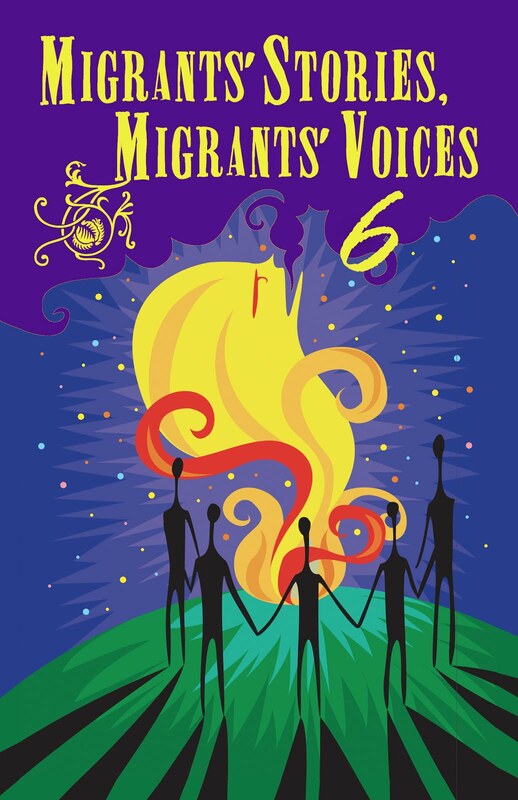 The NMS is one major event in the life of the church being spearheaded by the Episcopal Commission for the Pastoral Care of Migrants and Itinerant People (ECMI) of the Catholic Bishops Conference of the Philippines (CBCP). ECMI has been promoting hard the Church’s motherly concern for the migrants in the Philippines addressing particularly the issues and concerns of the overseas Filipino workers and their left behind families. 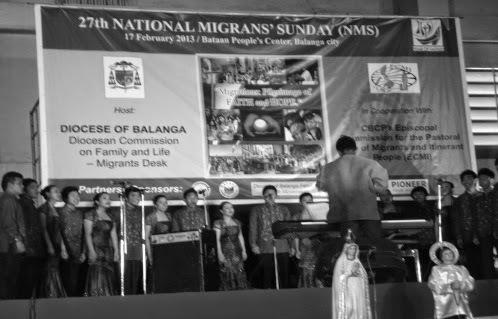 Balanga is the 13th diocese to host the celebration of the National Migrants Sunday after the CBCP-ECMI started to bring the celebration outside the Archdiocese of Manila in 2005. Last year, the NMS was held in the archdiocese of Cebu. Other dioceses that had nationally hosted the NMS were Lipa, Antipolo, Imus, San Fernando-Pampanga, San Fernando-La Union, Bayombong, Tagbilaran to name some. About 700 families of OFWs coming from various parishes had come to celebrate NMS which started with the mini procession at the provincial capitol grounds and proceeded to the Bataan People’s Center for the Eucharistic celebration presided by Bishop Ruperto Santos. About six other priests joined to concelebrate. Soon after the celebration of the Eucharist, the cultural program began with the rendition of the doxology and the national anthem by the Gintong Himig group from the high school department of the T. del Rosario College. Bishop Ruperto Santos was immediately called to convey his welcome message while Fr. Ronie Loreto, the diocesan director for the Family and Life Commission warmly delivered his opening remarks. An opening salvo was provided by the Teatro Peninsulares composed mainly of students from the Bataan Polytechnic State University (BPSU). Representing Bp. Precioso Cantillas, SDB, DD, the chair of the CBCP-ECMI, at the event was his executive secretary Fr. Edwin D. Corros, CS, to deliver the message of inspiration and explain the significance of the National Migrantss’ Sunday celebration. A well applauded musical number rendered by Koro Bangkal Magbikin composed by indigenous young girls and boys followed Fr. Corros’ inspirational note. Providing the highlight during the cultural program at the NMS event was the multi-awarded BPSU Chamber Chorale, known to be the pride of Bataan. The world-acclaimed choir serenaded the public with their great and wonderful rendition of several famous Filipino folk songs and popular music mostly excerpted from Walt Disney movies. The college student-members of the choir were recipient of prestigious awards at choir competitions both locally and overseas. They rendered a mini-concert as their generous contribution to the successful celebration of the 2013 NMS. Just before closing the event, Fr. Ronie Loreto was joyful to express his gratitude for the support he received from the various groups, particularly to the members of the organizing committee composed mainly by the diocesan commission on family and life. They were the ones who spearheaded the celebration. He also thanked Mr. Edmund Ruga, the ECMI coordinator for Luzon, who manifested real support and guidance to the hosting of the national event. Mr. Ruga confessed at the middle of the program that the whole event that the public had witnessed was a product of a very brief preparation, a preparation that they started only last January. Mr. Ruga likewise expressed his sincerest appreciation to the people of Balanga who had positively responded to the challenge of hosting the national event. He looked forward to the real work on building and sustaining a migrant ministry in the diocese of Balanga.